We keep trying out recipes on a weekly basis until we think we have truly nailed it enough to share with you. And today, we feel overly confident in sharing with you our treasured Chicken Supreme. We were inspired a few months back when we watched the way Gordon Ramsey butchers his whole chickens so cleanly. Forrest is so good at butchering a chicken now, I am very impressed! He takes the chicken breasts (tenders included) and pan sears them exactly like Gordon teaches. 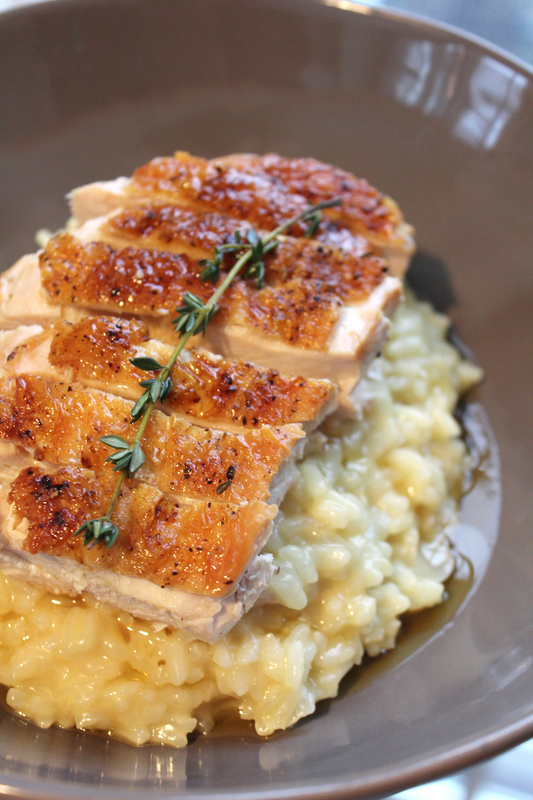 The result is an aromatic, perfectly moist chicken breast, with a flavorful, crispy skin. I’ve never had a chicken breast this good in a restaurant. Plus, using our cast iron skillet allows for a ridiculous pan sauce to be made at the end and poured over the whole meal. WOW. This meal is killer. Each time we enjoy it, we both say, “this is a meal we need to make next time we have guests over”. I am pleased to share with you, our CHICKEN SUPREME! 1. Place 1 Tbsp butter into the saucepan with your yellow onion and cook on medium low heat for 3-5 minutes, stirring often. Add white wine and stir in arborio rice. Stir until it begins to crackle, you’ll hear it! 2. Ladle in about 4 cups of your chicken broth, it works best to keep the broth in a separate pan, simmering hot. Throw some thyme in as well (the whole stem too). Cook on low heat until the rice has absorbed almost all of the broth, and then ladle in one more, and repeat until you are out of broth. 3. (Optional) We like to add up to 1 Tbsp of turmeric into our risotto. It gives it good color, but you also get all those lovely health benefits! You can also sprinkle in some fresh parmesan. 1. Once your chicken breasts are fully cooked, remove them from the pan to rest. Place your pan (hopefully a skillet) back onto the range. DO NOT RINSE OR WIPE IT CLEAN, we want all those yummy chicken juices. 2. On medium heat, throw your shallots into the pan with the garlic cloves and herbs your chicken cooked with. Let those sauté for a minute, and then add a splash of white wine to deglaze the pan. You can even scrape off all of the little “bits” that are stuck to the bottom. Let the wine cook off for another minute. 3. Pour everything from the pan into a strainer over a small bowl, and using a wooden spoon, press the contents through the strainer, letting the juices fall through. It does;t need to yield much, 1/4 cup is more than enough. 4. Pour this over your risotto and chicken for extreme flavor, and enjoy!